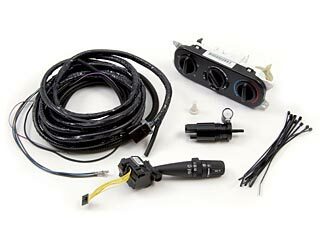 The Wrangler JK hard top wiring package (part number 82210215AG) for 2007 to 2010 Jeep Wranglers includes the parts you need for wiring a hard top. The package includes the wiring harness and switches to operate the dome light, defroster, windshield wiper and washer. This kit fits both two-door and four-door Wrangler models. If your Wrangler is heater only, without air conditioning, also order the heater switch (part number 55111842AB) in the Accessories tab above.